A dog is a man’s best friend. Your pooch is the companion that enjoys spending time with you, round-the-clock. And, if you didn’t know until yet, you can attempt to go kayaking with your furry pet, and enjoy some quality time together! That being said, let’s see what you should know about getting the best kayak for dogs! To start with, the kayak you select should easily accommodate your dog. Of course, depending on your pooch’s breed, you might require a larger or smaller kayak. Generally speaking, though, if you have a large breed dog, you should make sure that the kayak will hold you both safely. This should be next on your priority list. Kayaking is all about having fun and feeling good. In other words, the kayak should have an adjustable seat, knee and thigh rests, as well as adjustable foot braces. Otherwise, you and your companion might feel crowded and awkward. Another option worth considering might be getting a tandem kayak. This applies particularly in the case of large breed dogs. One of the many reasons we are so fond of our pets is their enthusiasm and joy. Still, this may have its downsides as well. For instance, dogs are prone to get overly excited when they see wild animals such as geese, squirrels, ducks, so on and so forth. Unfortunately, though, you cannot control what your dog sees. As a result, whenever such animals emerge out of nowhere, your dog will likely get hyperactive. So, investing in a stable kayak is a necessity. A wide beam could play a crucial role in this respect. If your dog loses its balance and falls in the water, this will inevitably tarnish its kayak experience. Thus, it might be afraid to come with you in your upcoming kayak journeys. That being said, if you know that your pooch is easily excitable, you should ensure that the kayak is stable enough, for safety reasons. Whenever you bring your pet to a new place, you must think of its safety. The same applies when it comes to kayaking with your dog. While you won’t necessarily require hauling a cage, having dog food and water is mandatory. Of course, the kayak you select should have enough space. This way, you could easily store everything you’d need for your pet’s safety. As a general rule, the bigger your dog is, the more food and water you’ll need to bring. I don’t suggest you allow your dog to drink lake water. That’s primarily because it is filled with duck and geese feces, which might make your pooch sick eventually. What Kayak Configuration Is Best for Your Dog? As you already know, kayaks are separated into two primary categories – namely single kayaks and tandem kayaks. Deciding which configuration suits your dog best will widely depend on its breed and size. To that end, single kayaks don’t support medium to large breed dogs. Small dogs, however, will effortlessly fit in a single kayak with their owner. While there might still be an overlapping situation in the footrest area, it shouldn’t be too uncomfortable. On the other hand, if you are okay with having your dog in front of you, in a separate seat, then a tandem kayak will do. Still, it’s worth noting that some dogs might hesitate to sit by themselves. That’s because they might feel frightened that they’re not near you. In order to gauge how much room your pooch needs, you should measure your pup from head to tailbone. This will allow you to determine which kayak would address your needs best, space-wise. Also, do bear in mind that while you might be able to fit yourself and your pooch in a single kayak, you’ll also need to pack a handful of essentials: food, drinks, and extra layers of clothing, additional personal flotation, and so on. Sit-on-top vs. Sit-in Kayaks: Which One Is the Best Kayak for Dogs? You will also need to choose between sit-on-top and sit-in kayaks. When it comes to sit-on-top kayaks, your legs are exposed at all times. On the other side, sit-in kayaks enclose your legs. The good thing about sit-in-kayaks is that they offer more space than their counterparts. For instance, in single models, teacup dog breeds such as Yorkshire Terriers or Chihuahuas will feel safe and happy sitting between your legs. Some dogs might even hide by your ankles. Still, we consider sit-on-top kayaks being more appropriate for kayaking with your pooch. Your dog will have the freedom to move around on the floating platform. If it wants to, it could even jump in the water. Plus, if flipped, the kayak cannot fill with water. That’s because such kayaks are equipped with scupper holes, which facilitate the water to drain into the lake, river, or ocean. On the other side, sit-in kayaks will inevitably get filled with water when flipped. Such a scenario would be disastrous, for all parties involved. What Should You Do Before You Kayak with Your Dog? Before taking your dog with you on a paddling adventure, there are some things you need to consider. Although kayaking with your dog is a unique, memorable experience, you should prepare yourself. To start with, your dog will require training. Even though dogs don’t have any trouble when it comes to swimming, the sheer sight of water might be upsetting to them – especially the first time you’re kayaking with them. So, try to comprehend your pup’s body language. See if your companion shows signs of hyperactivity, fear, or any other feeling while on the water. Additionally, it is equally important to train your dog to answer nature’s call. By all means, kayaking with your dog doesn’t mean that it can pee or poop anywhere it wants. That will pollute the water, and it should be avoided at all costs. Still, if your dog is already trained and responds to basic commands, this shouldn’t be an issue. Nevertheless, you should always have poop bags with you, just in case. Although stay is an important command, your dog might completely disregard it when it will see something new and exciting. So, you should teach him the leave it command, when you reach the land. What Equipment Should You Take with You? I wouldn’t advise you to tie the leash to the kayak. In the event in which the kayak turns over, or it gets lodged under a fallen tree or anything of the sort, the dog might get drowned. That’s why I prefer using a waist leash so that the dog is tied to me. Additionally, my dog always wears a harness. This way, I could easily lift it out of the water by the harness, if the situation asks of it. A life jacket is just as mandatory. Although dogs are natural swimmers, a doggie life jacket is helpful, especially if you plan on going through rough or fast water. Concurrently, the life jacket is a must if your dog isn’t an experienced swimmer, or it’s the first time you’re going kayaking together. Plus, such an item is useful if your pooch tires itself after swimming for a while. At the same time, it facilitates thermal protection in cool water. As for the toys and snacks, these will make the experience more fun for your dog. At first, it will be challenging; but, with time, it will be more fun, and you won’t want to go kayaking without your pooch! Sun Dolphin is definitely among the most renowned kayak manufacturers. And the Journey 10-foot sit-on-top is one of their best selling products. Being 10 feet long and 30 inches wide, this is a kayak that provides plenty of stability. This is crucial when you’re kayaking with your pooch, especially if your dog is prone to getting overly excited. What is more, it is made of UV-stabilized Fortiflex, a durable, high-density polyethylene. The best thing about this material is its impact resistance and durability. At the same time, the kayak is light enough, so that you can easily transport it by yourself if needed. Performance wise, this kayak ranks high, as well. It provides you a steady base, allowing you to easily shift your weight. I would recommend this for both lakes and rivers. Not only that the kayak is surprisingly stable, but it paddles and tracks with ease, as well. On top of that, you have plenty of storage space to include your pup’s necessary items. Remember to get scupper plugs in order to prevent the water from inconveniencing you. This kayak also provides enough space for both you and your dog to sit comfortably. Its beam is 30 inches, which translates into optimal stability on the water. From my experience, this beam width is wide enough as in to prevent your excitable pooch from tipping the boat over. Moving on to weight capacity, this is 250 pounds. Still, although it might seem like a generous weight limit, it isn’t necessarily so. It all depends on your dog. In other words, if your dog weighs over 75 pounds, this isn’t the right kayak for you. Furthermore, this kayak has a notable mixture of features that increase your comfort. Getting in and out of the kayak is a breeze, which is always a good thing. Also, it features adjustable foot braces, an adjustable seat, thigh and knee pads. Plus, this kayak has extra storage behind the seat. Since it is covered with shock cords, you can rest assured that your stuff will remain in place. The 12-feet Malibu is spacious enough to accommodate two people and a small dog, or one man and a large dog. Regarding the comfort level, this kayak has the typical amenities, namely two adjustable comfort seats and three molded foot wells. The later could be either a pro or a con, depending on how you put it. One one hand, you can only put your foot at a designated length. On the other hand, the foot brace is less likely to break. With a beam of 34 inches, it means that this kayak will remain steady on the water. Therefore, if you have a large, hyperactive pooch, this kayak is worth considering. Due to its weight capacity of 425 pounds, you won’t have any restrictions in this department. Still, that makes it rather heavy and challenging to transport. This kayak could be an ideal pick for you if you’re tall. The seat is a tad higher than in the case of the standard kayak. Plus, moving around while paddling is effortless, which adds an ounce of comfort for tall kayakers. The 30-inch beam means that your dog is less likely to tip the boat, which is a major plus if you own a large breed dog. The Tribe behaves perfectly in different types of waters. Being quite thin, it easily navigates in oceans, lakes or even rivers. As for the weight capacity, it’s not too bad either – coming in at 350 pounds. As for the gear storage, the kayak has two shock cord covered wells on the stern and bow of the boat, as well as a useful waterproof compartment in the cockpit. 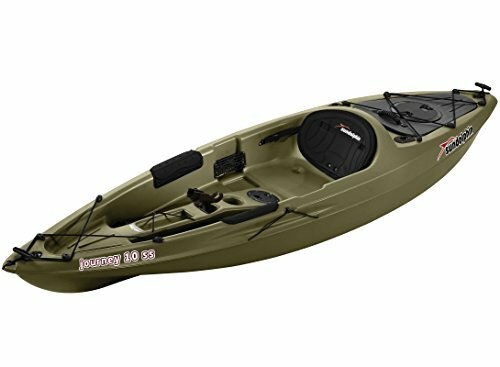 This kayak’s optimal stability and versatility make it an excellent choice for both anglers and recreational paddlers. It's 500 lbs capacity means there is plenty of room for two people and a pet. Due to the ample storage available, you can get ready for the journey so that you have everything you might need at hand. The Pescador offers notable improvements, in terms of comfort level. The comfort seating system featuring thick cushioned padding and the adjustability of the seat offer customized support. And, most importantly, this kayak is wide enough to be quite stable. Yet, it is sleek so that it slices through the water effortlessly. The Pescador incorporates the perfect balance of performance, fun, and safety. On top of all, the built-in buoyancy allows you to relax on the water, even when you have a hyperactive pooch on board. And lastly, this kayak is fit for all types of waters. The best kayak for dogs will let you and your best friend have the time of a lifetime on the water. 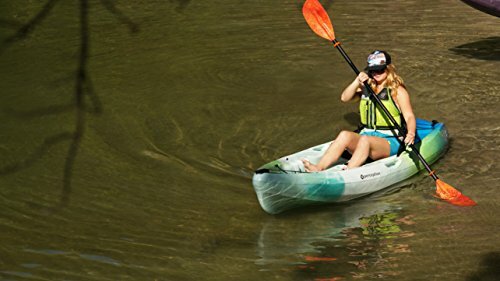 Make sure to get a big, stable kayak that will also be comfortable while you're out on the water. And remember, sit-on-top kayaks are generally considered better to ride with dogs. Do you take your dog out with you? How do they do out there?